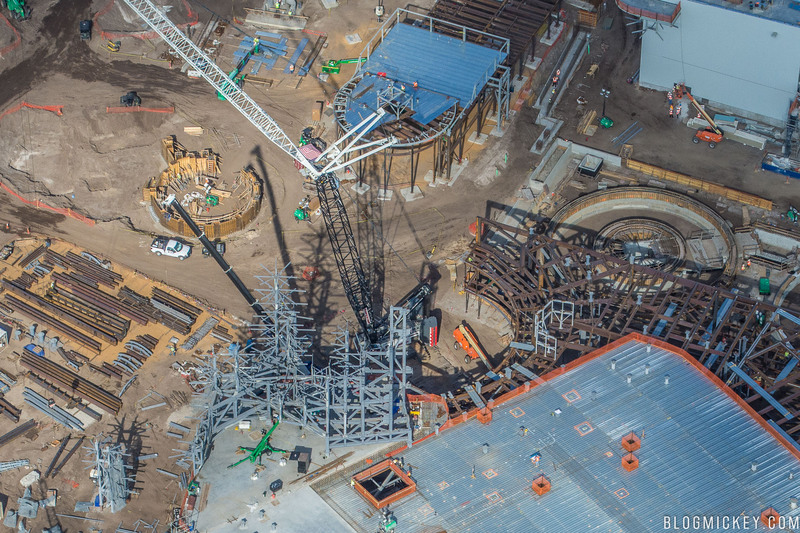 We’re back with another aerial update, this time of the highly anticipated Star Wars: Galaxy’s Edge. 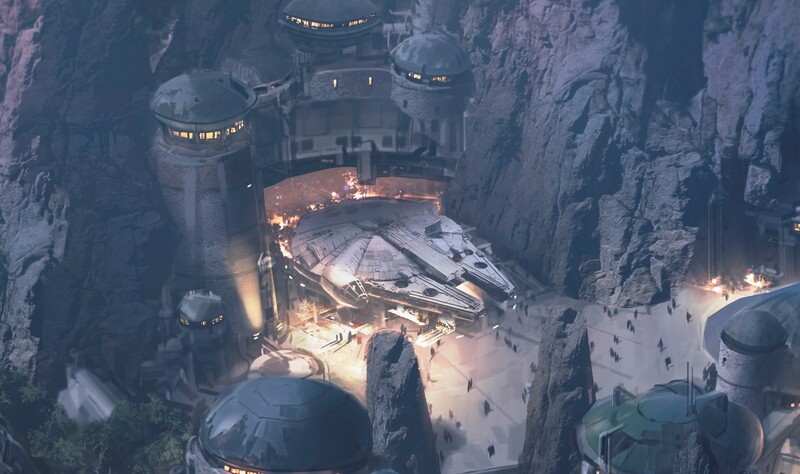 Set to open in 2019, Star Wars: Galaxy’s Edge will put guests on a remote outpost planet where they’ll be able to fly the Millennium Falcon and escape the First Order. 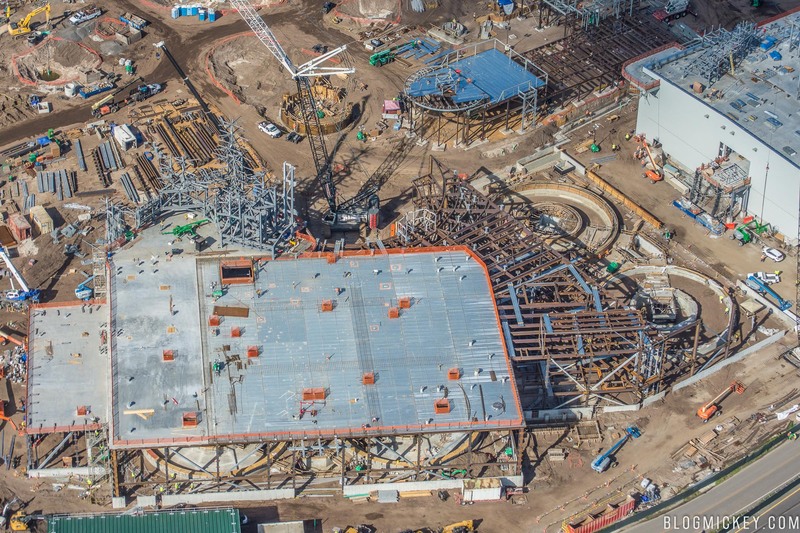 Let’s take a look at the latest construction progress from the air. First, an overview of the land, looking back to front. 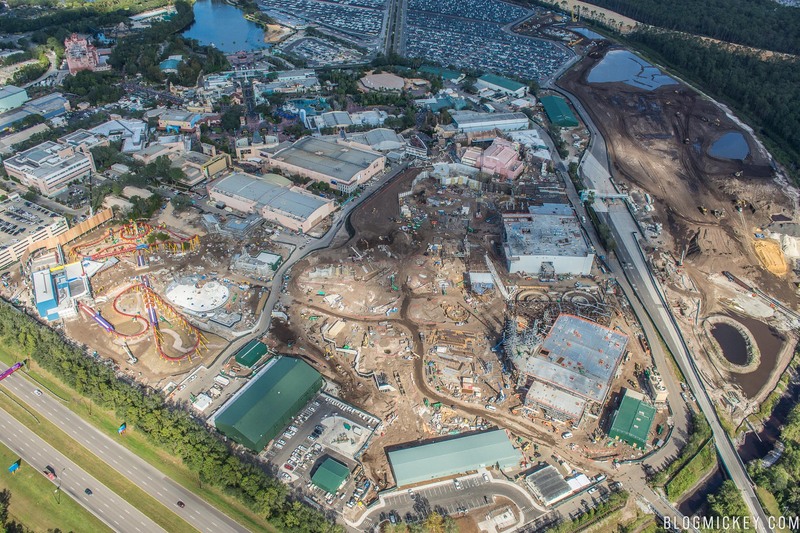 An even wider shot, showing the neighboring Toy Story Land to the left. The two most prominent buildings are the Millennium Falcon attraction and the First Order Battle Escape attraction. 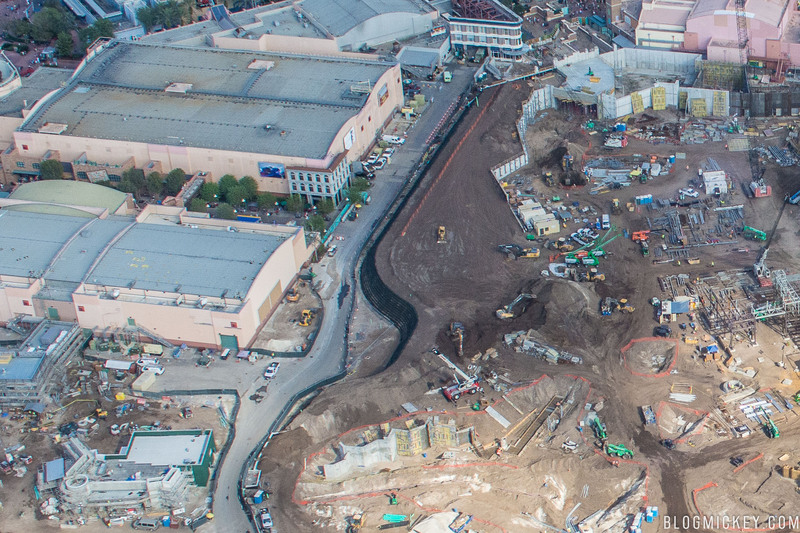 From the air, the Millennium Falcon attraction is, by far, the most interesting to look at. Let’s get a closer look. 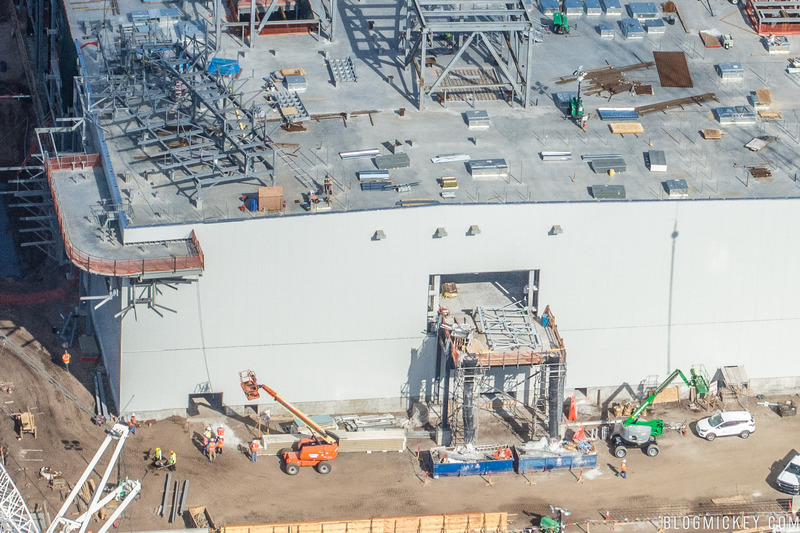 A few different angles show the progress on the building since we last saw it. 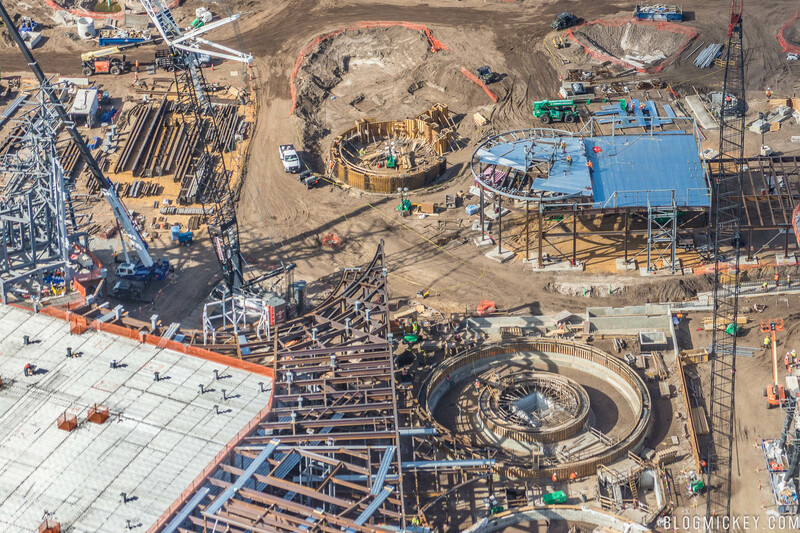 A closer look shows that the circular courtyard set to hold the Millennium Falcon has been formed. Concept art showing the circular courtyard. 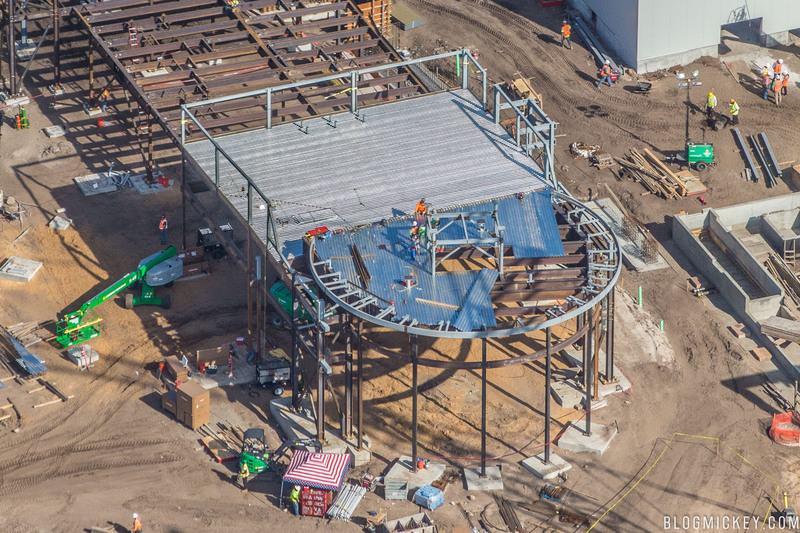 A closer look at the steel framing that shapes the mountains. 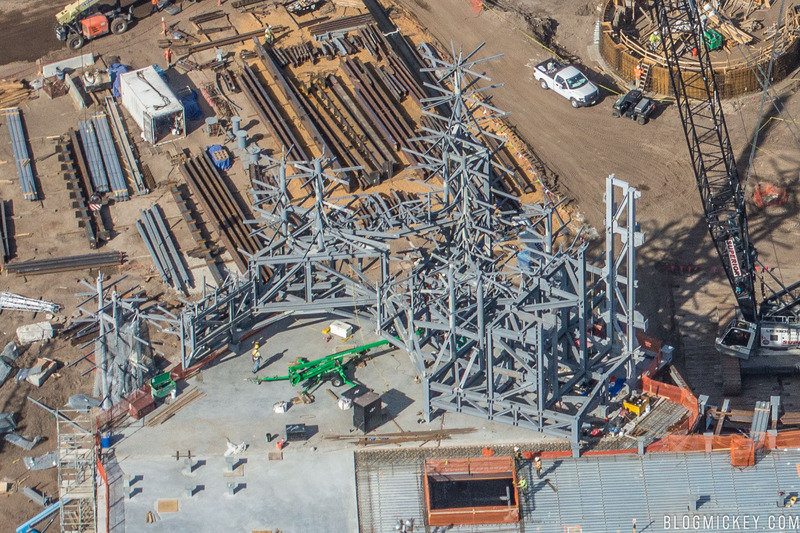 These will eventually reach 130 feet high. Nearby, a new building has gone vertical. 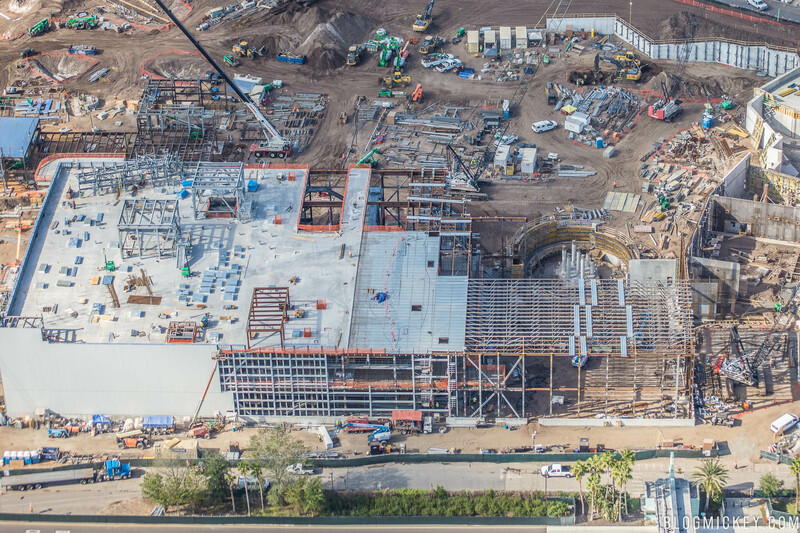 Another angle shows, from bottom to top, the Millennium Falcon attraction, Millennium Falcon circular courtyard, the new building highlighted above, and a new circular form in the early stages of construction. 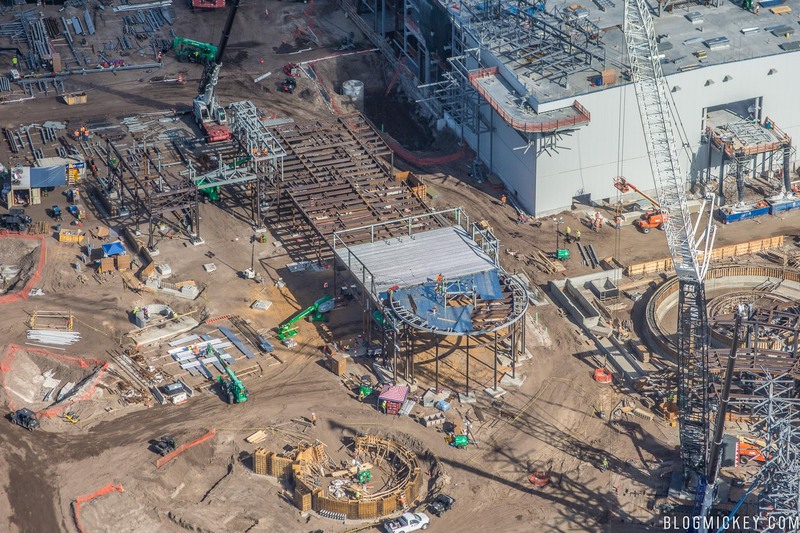 Shifting our attention more towards the front of the land, we can see the graded land that will be used to visually hide Star Wars: Galaxy’s Edge from the rest of guest areas. 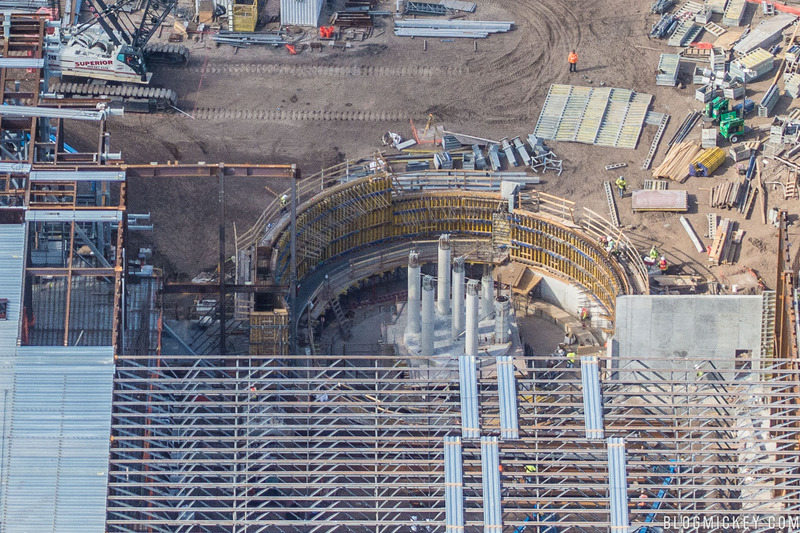 Continuing on to the Grand Avenue entrance to Star Wars: Galaxy’s Edge, we can see that the tunnel has been completely enclosed since our last look. 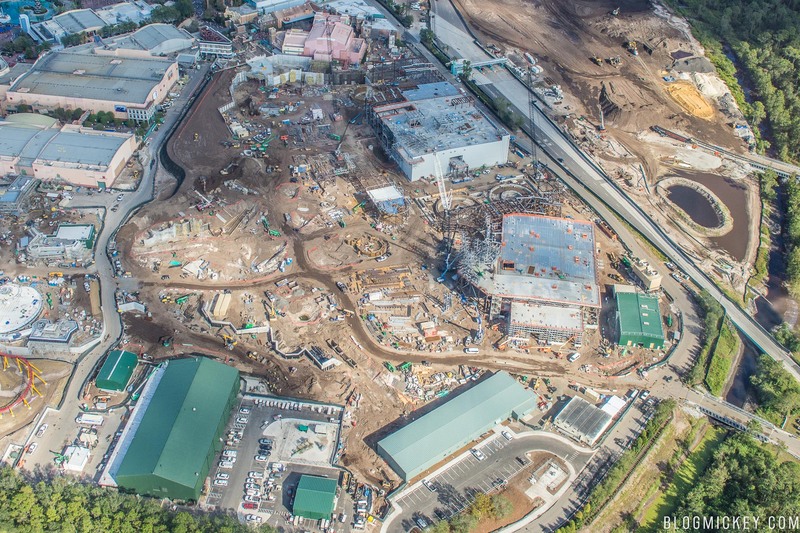 Finally, let’s look at the First Order Battle Escape show building. The building appears to be early halfway enclosed. 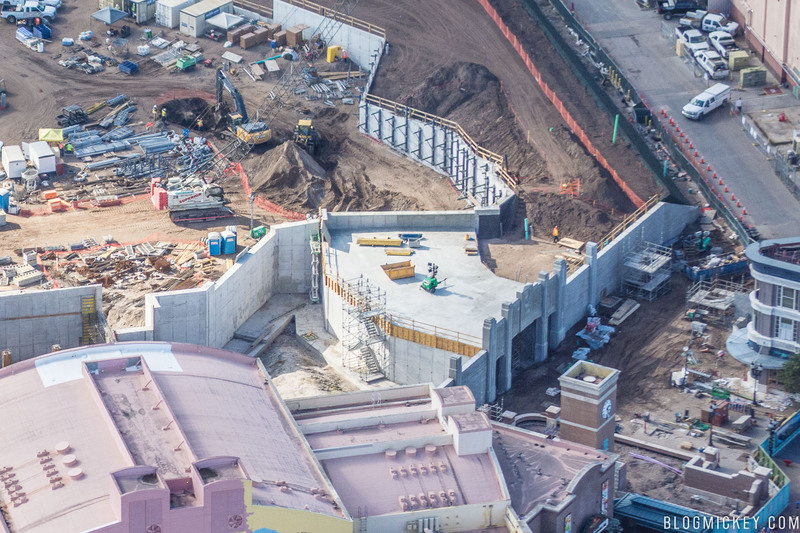 A closer look at the deep circular pit that has been under construction since the beginning of this massive project. 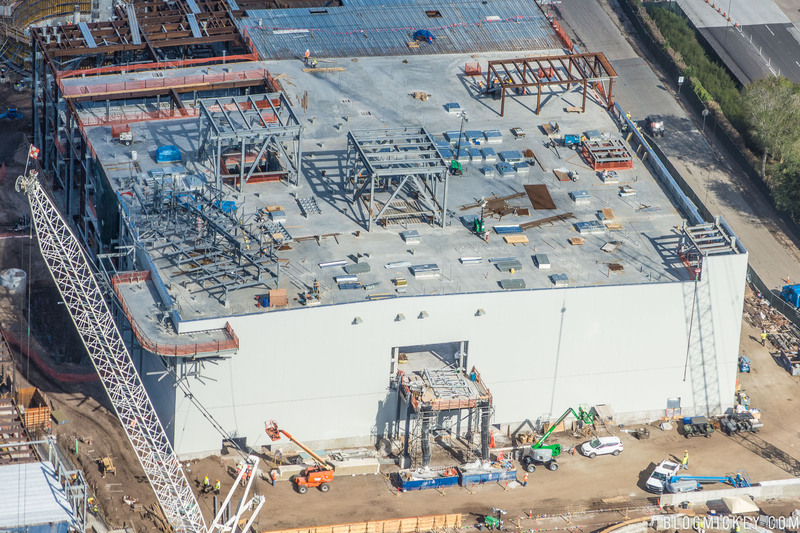 The enclosed side of the building has a new overhang and upper floor side access. 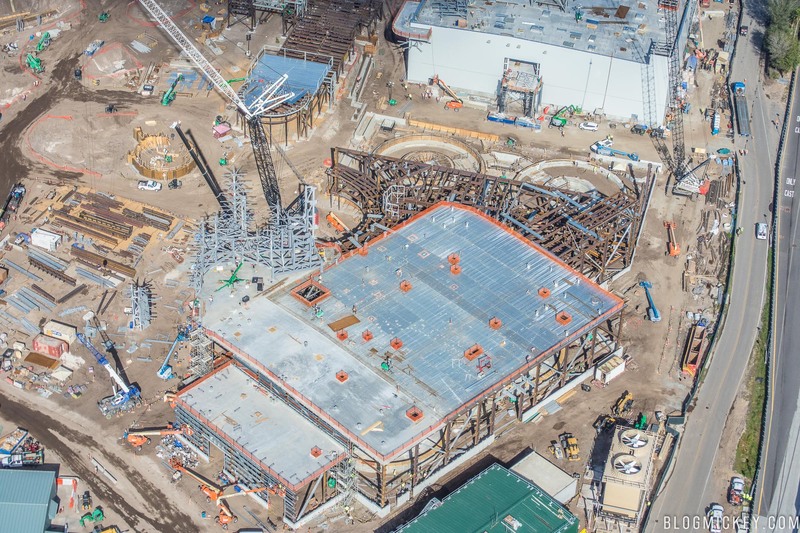 To compare the progress made on the land, here’s our last update from September. 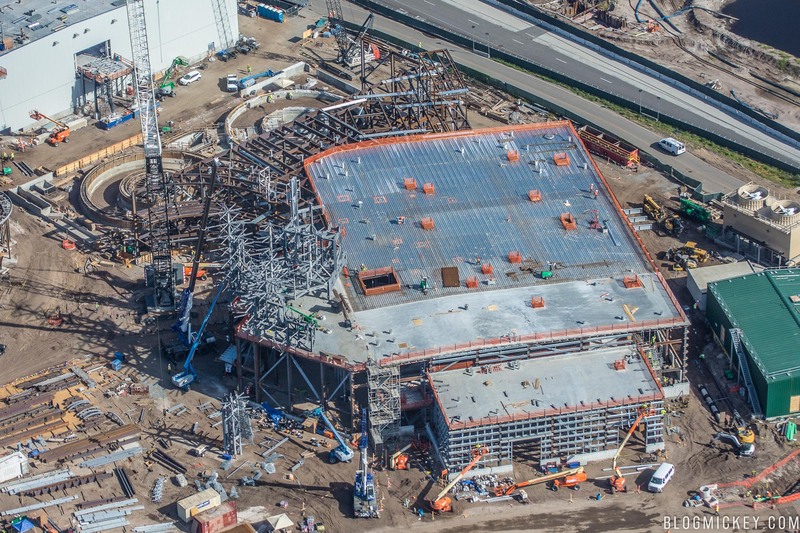 Star Wars: Galaxy’s Edge is set to open at Disney’s Hollywood Studios in 2019.